I used to love the water. Growing up in Corpus Christi, my family spent many weekends at the beach. Other weekends, I spent at the lake swimming, jet skiing, or hanging on to a tube for dear life while being pulled by a boat. I dreamed of growing up, owning a lake house, and having all kinds of water toys. Two years ago, all of those priorities changed. It was a normal summer weekend. My uncle owns a house on Lake Placid in Seguin, so it was common for all of us to spend weekends at his place. We would spend the whole day at the lake riding boats, floating in the water, and taking turns riding the jet skis. That day was another perfect day with the family. After a long day in the sun, my family decided to call it a day and head home. Unfortunately for me, the day was far from over. After others headed home, my 8-year-old nephew begged to ride the jet ski one more time. Since he wasn’t old enough to operate it, I volunteered to take him on one more ride. We hopped on the jet ski and took off for one last cruise. Lake Placid is very narrow. With little space to operate, it’s important to pay attention to your surroundings. State law makes it illegal to operate a personal watercraft within 50 feet of another personal watercraft, motorboat, platform or person. On such a narrow and crowded lake, abiding by that rule can be challenging. On the jet ski, I remember telling my nephew was that I was going to turn around and head back to the house. Suddenly, everything went black. I woke up on the back of a boat, surrounded by high school kids. I remember looking around, confused, and then seeing my nephew holding his throat while being helped by two young girls. I also noticed other kids at the front of the boat looking back at me in absolute terror. I asked one of them to take me back to my uncle’s house. He looked at me and said “a helicopter is coming to get you.” I still didn’t quite understand what was happening. I now know what it means to be “in shock.” I looked down at the ground and noticed a giant puddle of blood. I then felt my face and realized why I was headed to the hospital. Later, I learned that I had been clothes-lined by a ski rope from another boat. The rope first hit my nephew in the throat. He fell backwards and his head smashed my nose. The rope then lashed back and wrapped around my face before it snapped in half. The game warden said that it was the first time he’d ever heard of a ski rope snapping on another human being. That is not a badge of honor that I’m proud to carry. I was flown by helicopter to Brooke Army Medical Center. I was wheeled to a room. A number of doctors kept my pain under control and made sure I didn’t have life-threatening injuries. My wife soon came into the room. I remember seeing her shaking from head to toe. She didn’t like the idea of my injuries being visible to everyone, so she covered me up with tape and paper towels. Secretly, she said she worried how she was going to help me cope with facial paralysis and deformity. My nephew had been transported to a different hospital with trauma to his throat. Luckily, he did not require any surgery. He had more emotional wounds than physical. He was in the hospital for two days before he was released. He still has a large scar that wraps around his throat. Plastic surgeons did an absolutely amazing job during my operation. I remember being rolled out of the operating room and seeing my wife’s face. She was both confused and excited. She thought I would have severe deformities, but was amazed they were able to make me look normal again. Today, I have absolutely no desire to be back on the lake. I cringe when I think about the day when my two young boys will be invited to spend time at a lake with friends. I wish I could put them in a bubble and keep them away from the water. Upon reflecting on the accident, I realized that I spent thousands of hours on the lake. I can recall lots of fun times and even a few close calls. We always discussed the importance of life jackets, which ultimately saved my life. After being clothes-lined by the rope, I was immediately left unconscious. My life jacket kept me afloat and allowed others to come to my rescue. While we frequently had the “be careful” and “don’t forget your life jacket” discussions, there also were important opportunities missed to discuss rules, regulations, and potential hazards. Every summer, there are a lot of opportunities around San Antonio to enjoy the outdoors and spend time on a river or a lake. Braunig and Calaveras Lakes, lakes built over 40 years ago to cool our power plant equipment, are great areas for fishing and recreation. But remember, wherever you are or whatever you do, start your day talking about safety. We at CPS Energy make this a priority, but I urge you to also do it at home with your family. Talk about the day’s activities, the laws to follow, and the risks and hazards associated with those activities. These conversations may save a life. 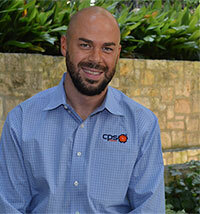 Chuck Francis is senior manager of Employee Development at CPS Energy. Glad to know chuck and his nephew are doing well.